It’s been a rough week here in Boston. We’re safe. Everyone we know is safe. We live far from the finish line, but a mile from Watertown. I don’t have anything profound or original to say about the situation, except that last week’s events have put my ongoing series of pressure cooker recipes on hiatus for the time being. Instead, I’m going to share a story from this summer that always make us chuckle. 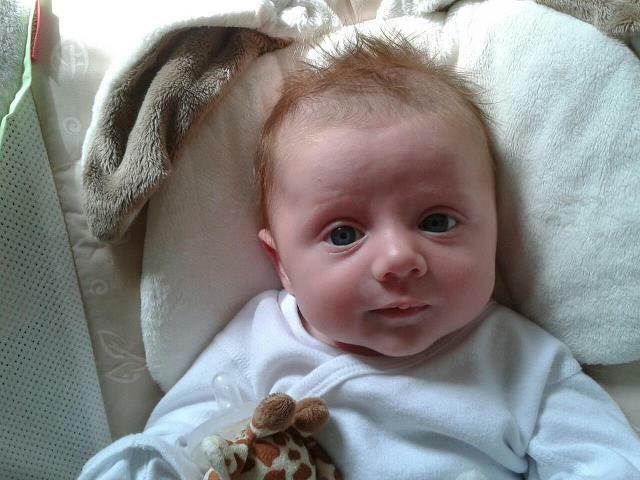 It happened in August, during my second trimester. A few weeks later, a coupon arrived in the mail from the ice cream company for a free product of theirs with up to a $7.99 value. Still, this incident led me to take stock of the outsized role that the chocolate-peanut-butter flavor combination plays in my life. There were other clues: there was the fact that I didn’t hesitate to eat the squished Reese’s Peanut Butter Cup I found in my spring jacket pocket last week. (It was not delicious; we think it was from Halloween.) 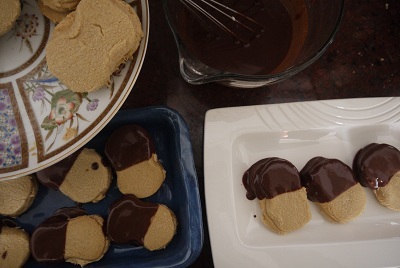 Another was, when I was sent a cookbook of “homemade versions of your favorite brand-name treats,” I zeroed in on the homemade Nutter Butters’ recipe, but with an important amendment: I would bake them, and then dip each end in ganache. And that’s just what I did. Chocolate Peanut Butter Explosion accomplished. At this rate, I’m never going to shed the rest of this pregnancy weight, but honestly, after this week, it really doesn’t matter. The cookbook is Classic Snacks Made from Scratch: 70 Homemade Versions of Your Favorite Brand-Name Treats, written by Casey Barber, editor of the online magazine Good.Food.Stories. 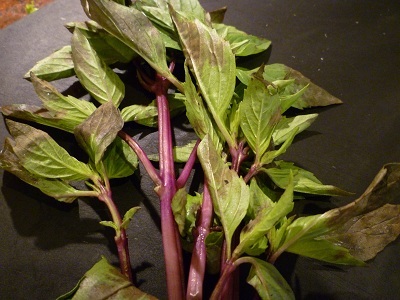 (www.goodfoodstories.com). It’s full of really great-sounding recipes for things like Nutter Butters, Mint Milanos, Twinkies, Goldfish Crackers, Funyuns, and Klondike Bars. A lot of its stuff was forbidden fruit growing up, first because my parents were more into actual fruit rather than giving us packaged treats, and, second, because a lot of it isn’t kosher. I’m happy to report that the Nutter Butters were spot-on, and really not a big deal to make. I made these this afternoon. I was able to feed Lilli, change Lilli, dunk a diaper, put Lilli down for a rest, and also have her hanging out with me in the kitchen, in between steps. 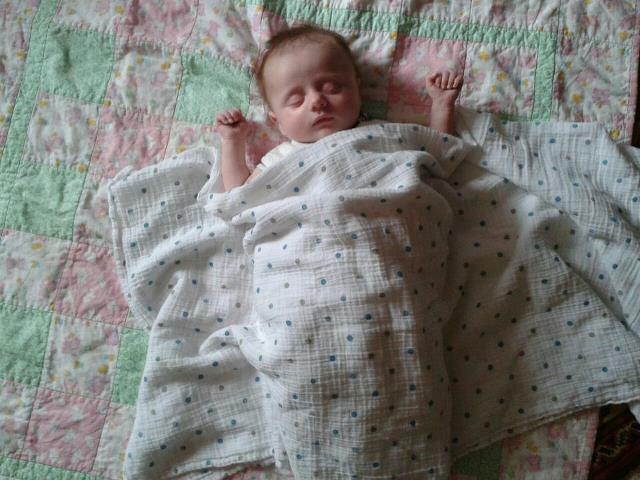 They weren’t a big deal to make, really, and I’m saying that with a 12-week-old napping nearby. 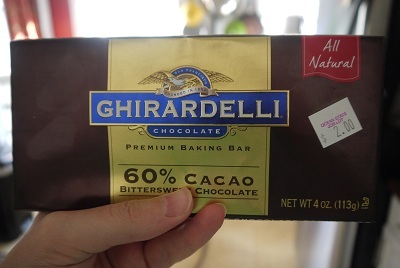 The ganache is just a basic recipe, although I want to make note that the Ghirardelli chocolate I used was purchased at Ocean State Job Lot for $2 a bar. (I bought four. They’re in the freezer.) I rarely (and by rarely, I mean, never) use Crisco, but was pleased to discover that it is sold in bars, like butter, making measurements very simple. One Note: If you’d like to join me in donating to help the victims and families of the attack, you can do so at The One Fund. *Spritz your measuring cups with baking spray to help extract all the peanut butter you’ll be using for this recipe. Whisk the flour, baking powder and salt together in a medium bowl; set aside. In the bowl of a stand mixer fitted with a paddle attachment, beat the butter and sugar together on medium-high speed for 3 minutes, until light and fluffy. Scrape down the sides of the bowl and stir in the egg and vanilla on low speed. Add the peanut butter and stir on medium speed for 2 minutes more. On low speed, stir in the dry ingredients a half cup at a time until just incorporated. 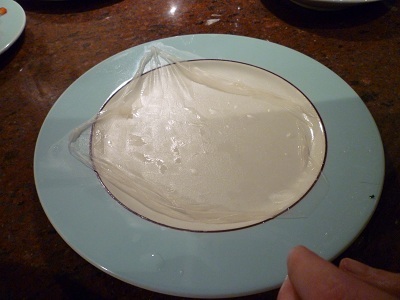 Spread 2 large sheets of plastic wrap on clean surface and divide the dough into 2 equal parts on the sheets. 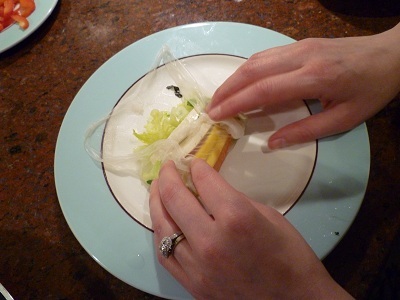 Wrap each piece tightly to form a rough cylinder about 8 inches long and 1 ½ inches in diameter. Place the dough logo in the freezer for 30 minutes. Preheat the oven to 350F. Line 2 baking sheets with parchment paper or Silpat liners. Cut the chilled dough into thin (no more than ¼ inch) slices and place on the prepared baking sheets. Put the sheets in the oven for 30 seconds, then remove and form each cookie into a rough peanut shape by squeezing the sides gently in the middle to form grooves. Return the sheets to the oven and bake for 13 to 16 minutes, until the cookies are dry and no longer shiny on top but not yet browning on the edges. They will seem slightly underbaked, but remove them anyway. Cool the cookies completely on wire racks. While the cookies cool, make the filling. 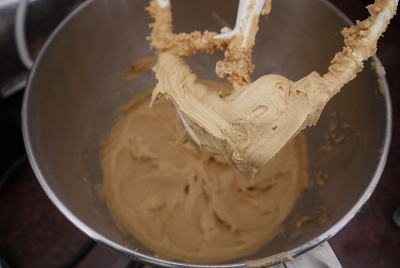 Cream the powdered sugar, peanut butter, and shortening together until fluffy, using a stand mixer fitted with the paddle attachment or an electric hand mixer – first on low speed until the sugar is incorporated, then on high speed to fluff it up. Spread the filling evenly on the flat (bottom) side of the half cooled cookies. Top with remaining cookies. Place chocolate pieces in a heat-proof bowl. In a small saucepan, gently heat the heavy cream to a boil on a medium-low burner. Remove the heated cream from the stovetop and pour over the bowl of chocolate. Let stand 10 minutes. Whisk the cream and the chocolate, which will be very melted at this point. Dip one end of each cookie into ganache and lay the cookie on a baking pan or plate. To chill the ganache, place the tray in the refrigerator for at least 20 minutes. Store the cookies at room temperature in an airtight container, with pieces of parchment paper in between the layers of chocolate-covered cookies, for up to a week. A few summers ago, I had the privilege of judging a local Iron Chef competition. The secret ingredient was not some creature off the ocean’s floor or an exotic fruit flown in from a far off island. Instead, it was the contents of the contestants’ Community Supported Agriculture (CSA) boxes, to highlight New England’s incredible summer bounties. The teams used different farms and were assured that they didn’t need to use their entire boxes. To make sure the competition was fair, a list of standard vegetarian ingredients was issued, to be used in moderate quantities to enhance the vegetables: eggs, butter, up to 24 oz of soy products, 1 can beans/chickpeas or up to 2 lbs dried legumes, vegetable broth, garlic, onion, nuts, flour, rice, quinoa or couscous, cornstarch, cocoa, sugar, up to 6 oz of cheese, salt, pepper, milk, extra-virgin olive oil, vegetable oil, mustard, vinegar, soy sauce, lemon/lime juice. Contestants were allowed to use any spices but got extra points for fresh herbs. “Hey,” they responded, “We were at the Springsteen concert last night. It got out late. We didn’t have enough time. The crust is homemade, if that helps.” It helped, a little. Duly noted. 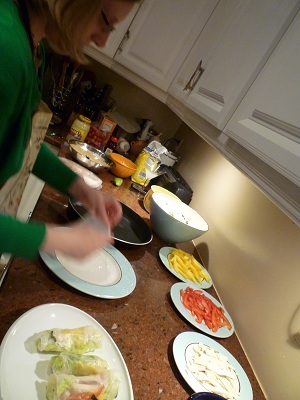 I was outvoted ultimately, and realistically we couldn’t award the CSA Iron Chef competition to fresh mango summer rolls. I relented and begrudgingly shaved points from their score. The winner, I guess I should just mention at this point, was the tomato granita team, which was captained by my sister. Hey, I’m nothing if not impartial. The fresh mango was such a treat for me. I never buy them, exactly for the reason why my fellow judges felt they had no place in the competition. But here’s the thing: It’s mango season, really and truly. As Melissa Clark wrote last month, springtime is mango season in India and all the hot steamy places mangoes grow. My Facebook feed is now full of photos of friends’ mango trees in Miami, brimming with the orange gems. 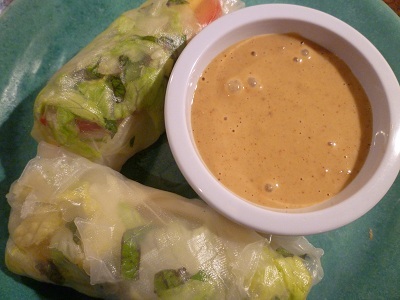 Considering that we seem to have skipped from winter right into summer (complete with thunderstorms and tornadoes) the time is right for fresh mango summer rolls. I bought my rice papers at H-Mart in Burlington, but I’ve also picked them up at Super 88 (now Hong Kong Market) at Packard’s Corner. The Thai basil and fresh mint are what makes it taste like a summer roll. I picked up my bunches at Russo’s this time around, but I know H-Mart and Hong Kong Market sells them as well. If you’ve never made a summer roll before, don’t fret, it’s very simple. Think burrito. Some of the rice papers will rip, but just keep going. And please don’t worry if they don’t all look gorgeous; they’ll still taste delicious. Make sure you have all your ingredients laid out on the counter assembly-line style, starting with a pan of warm water for soaking the rice paper. 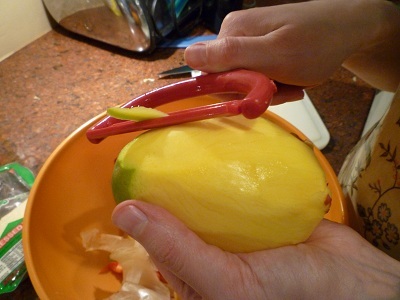 To prepare the mango: I peel mine with a peeler, then I stand it up and, with a sharp knife, cut the flesh right up off its pit. For this dish, I slice everything very, very thin, the length and width of two matchsticks. Most recipes I’ve read for summer rolls call for Napa cabbage, although I’ve never actually been served them that way in a restaurant. After ranch dressing, this is the best use of iceberg lettuce. I thought that some crisp, sweet red pepper would be nice with the mango, and it was. I also used some fresh tofu, and I’ve seen some restaurants use grilled meat in theirs. I say go for it, if that’s your thing. Otherwise, hello, vegan yumminess! One head iceberg lettuce, thinly sliced. Use a plastic knife if you’ve got one handy; steel knives will cause the lettuce to brown. 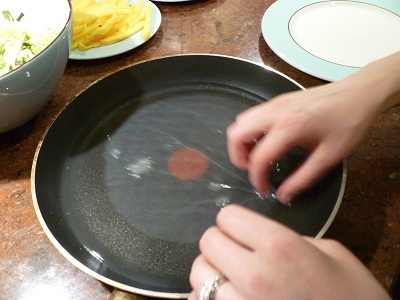 Fill a large pan with warm water and set on counter. Next to that, place a large plate. If you have room on your counter, place the herbed lettuce directly in back of the plate. If not, place it right next to the plate. 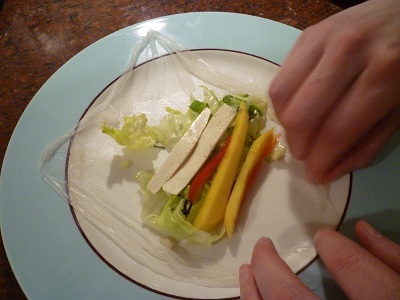 Next to that, set your plate of mango, tofu and red peppers. Take one sheath of rice paper, gently lay it into the water, swish it between your fingers for about 15 seconds, until it softens. Remove it from the pan and lay it on the plate. Place about ¼ cup of lettuce near the bottom of the paper. 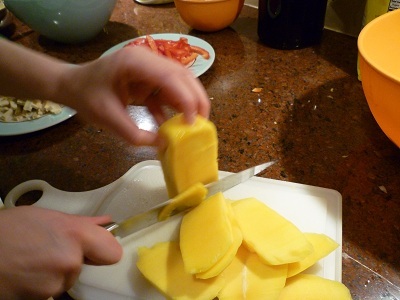 Add a slice of mango (or two), red pepper and tofu. Fold up the bottom, then the sides, and roll up to the top. And please don’t get frustrated if the first two or three, or even the seventh, rips. It will happen. Mix all ingredients in bowl and give it a taste. Maybe you’ll realize it needs more sugar. Maybe you’ll think it needs more ginger. Definitely fine tune it to your own tastes. Also, this makes a ton of sauce. It will keep in the fridge for a few days. My suggestion is to find yourself some steamed broccoli and some noodles. Maybe brown rice. I promise you at no time will you throw your hands up in the air and shriek that you have too much peanut sauce on hand.